Automate Your Outbound Calling Activities To Close More Deals! See a LIVE Demo!Get Started! Call Logic is an MRI Network Compliant Auto Dialing Software that is making recruiters more efficient when making outbound calls their contacts and possible candidates. 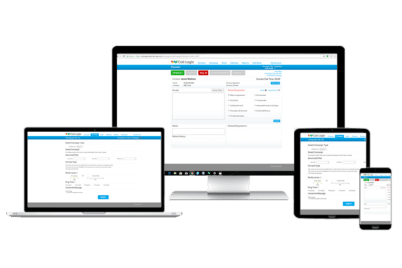 Call Logic is currently integrated with applicant tracking systems like PCRecruiter and Blitz Sales Software but can also be used standalone. Why Use A MRI Network Compliant Auto Dialing Software? Cloud-Based Auto Dialers are the most efficient form of outbound calling. For any office, that makes calls in mass, an auto dialer is for you to get through lists of contacts more efficient than ever before. Why Switch To Call Logic™? People are switching from their current auto dialing software to benefit from a fully TCPA Compliant, integrated system to start being more efficient in their business — Call Logic. You Can’t Afford Not Choosing Call Logic! Still Looking for a Trial Period? Can I use my current phone system? YES! That’s the magic of Call Logic. You can connect with any phone at any time. From cell phones to phones in the office (VoIP) to even phones at home. Simply call into the number provided by Call Logic to begin the calling campaign. Does Call Logic provide any reporting or call recording features? Yes, we offer both a summary as well as a detailed reporting on every call campaign. Call Logic offers the ability to record a single call or a Call Logic offers the ability to record a single call or an entire call campaign. Is this dialer TCPA Compliant? Yes, not only do we have internal evaluations to ensure compliance. Does everyone in my office need a Call Logic account? NO! We are strong believers in paying for what you use. That being said, you only have to pay for those who will be making outbound calls. Does Call Logic scrub my calls? Absolutely. Call Logic will scrub every call microseconds before the call is placed. Does Call Logic offer click-to-call? Yes! Call Logic does offer an option to place a single call through the system or to a list of contacts. Still Unsure How Call Logic Can Increase Revenue For Your Firm? Call Logic was designed for professionals with decades of experience working with different call management systems in multiple industries. This is a simple yet powerful software to make any workplace making outbound calls more efficient. We have worked to tailor software designed to control costs and maximize profits. What Are Other Professionals Saying About Us? “Call Logic helps my business grow by making all of us more effective and efficient! So much easier to do call backs AND a piece of cake to keep track of employees progress. LOVE it!" "I use Call Logic DAILY. It speeds through the calls that don't answer and skips on to dialing the next number without me having to wait and leave a message. It saves me time and money. I have been using Call Logic for about 6 months now and I have seen steady growth in my sales. I recommend Call Logic to all my agent friends." “I’m loving Call Logic features and management options, and getting started was quick and simple. I've upgraded to two callers to ensure I have my marketers talking to prospects and maximizing my investment in staff and agency returns! I am so glad I found Call Logic!" "Call Logic has significantly improved my outbound calling productivity. With Call Logic I make 100 calls per hour which enables me to quote more people and close more deals. I would recommend Call Logic to anyone aspiring to grow their agency"